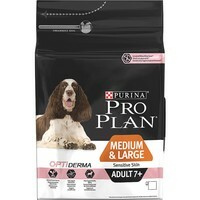 Purina Pro Plan OptiDerma Sensitive Skin Medium & Large 7+ Adult Dog Food is a balanced and complete diet for medium and large breed dogs over the age of 7 to help support their healthy skin and shiny coat. Formulated with a carefully selected blend of essential nutrients that have been proven to target skin and help support a healthy coat, Purina OptiDerma 7+ also contains selected sources of protein to help reduce possible skin reactions associated with food sensitivity. Salmon* (17%), Rice* (16%), Maize Gluten Meal*, Dehydrated Salmon Protein*, Maize Starch, Maize*, Soya Meal*, Animal Fat, Minerals, Dried Beet Pulp*, Cellulose, Dried Egg*, Soybean Oil, Digest, Fish Oil.